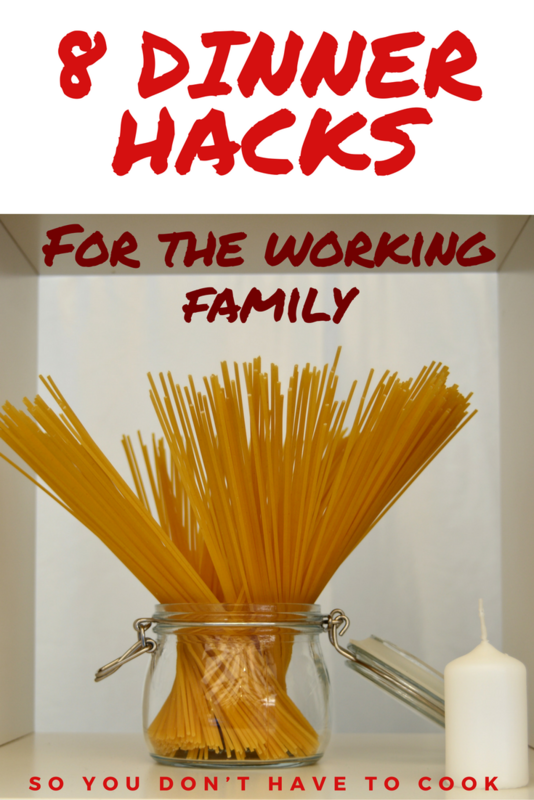 8 Dinner hacks for the working family who comes home hungry – And Why Not! It’s pretty much widely accepted that when you’ve got two busy parents who work, getting dinner on the table frequently gets hairy. I try to be that mom and prepare a week’s worth of meals on a Sunday, but… ok, I’m straight up lying; I think I did that once. The bottom line is, on any given day, when we get home from work and school and activities, we are all hungry and hangry (me above all. Stay out of my way, and I mean that. I have been known to bite people when in this condition), and we don’t want to cook. Or perhaps we wouldn’t mind cooking, but we didn’t plan ahead, and even though we have a freezer full of steaks, fish, and other good food, there is nothing on hand to cook. Frequently, we’ll reach for the menu drawer, but sometimes, the thought of takeout also kind of turns the stomach, or maybe we’re too hungry to wait for delivery or go get the food. Plus, it’s not exactly easy on the old wallet to order food multiple times during the week. But we can’t live on Cheerios and cheese sticks. Well – to be honest, I think the kids would be perfectly happy to live on Cheerios and cheese sticks, but that might fall under the “neglect” category in some circles, so, it’s at the very least suboptimal. In order to adjust, over the years I have come up with a few hacks (they didn’t used to be called “hacks;” that’s a new thing, but I’ll use it b/c I like it) that help us put relatively decent food on the table without cooking. If you keep a big bag of frozen jumbo shrimp in the freezer, you basically have a rapid meal on your hands at any time. 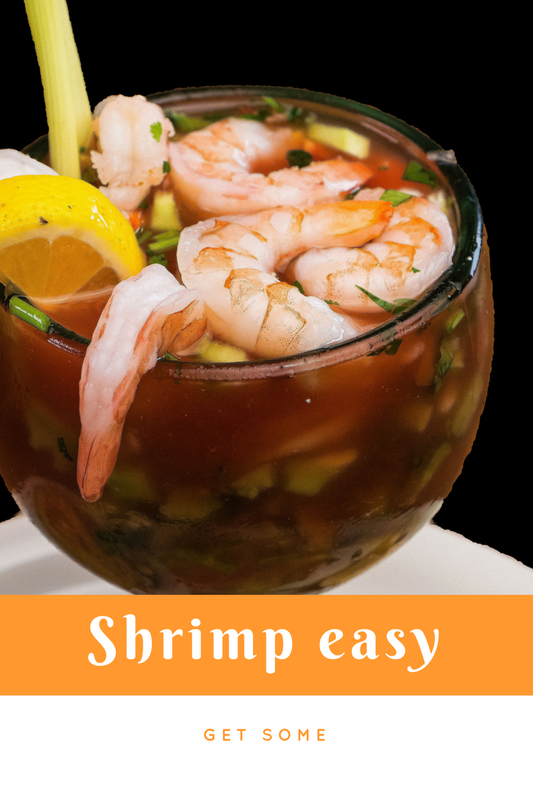 Even if you didn’t plan ahead and defrost something for dinner, you can grab a bunch of frozen shrimp and defrost them really quickly by putting them in a bowl of tepid water. You can then cook and eat them any way you want, and it looks impressive. Just remember to keep up with buying more bags when you run out. Everyone has a supply of spaghetti and jars of red sauce in the pantry, and if you’re us, also shells and wheels. But I really feel like box pasta and Prego are something only kids and college students can tolerate. And it takes longer than you might think to cook up a bunch of spaghetti: you gotta boil the water, and then it’s like 10 minutes for the pasta, and when you have two tenacious hungry animals nipping at your knees—where’s the pasghetti?—that’s too long. On the other hand, what’s easier than pasta and sauce? I started buying pasta and sauce out of the refrigerated case at the market. It takes seconds to make, and tastes a lot better, although you do still have to boil the water. Bonus: the tortellini come in spinach and cheese. Hidden vegetables! Well, sort of, I’m sure there is like a teensy amount of actual vegetable, but you can still check off “gave kids vegetables” on your “good mom” checklist. And if you want to be fancy because you’re an adult, if you keep a bottle of infused olive oil in your pantry, you can eat your fresh pasta with said oil and parmesan cheese. Okay, bear with me. This does not apply to everyone, only to those who either have an Ikea nearby or plan to make a trip to Ikea at some point. At the super market there they sell these things called “rosti,” which are basically frozen potato pancakes. It takes maybe 3 minutes per side to cook them in the pan, and you can pile stuff on top, like ham, cheese, fried eggs. You can make a decent meal out of 2 or 3 of them. And on the subject of eggs…That’s a no brainer. You can always make an egg or a cheese omelette in a pinch. Breakfast for dinner has and always will be super fun for the whole family, amirite. Plus, apparently, and I didn’t know this, in Spain white rice and scrambled egg plus/minus tomato sauce is a perfectly acceptable evening meal, especially for kids. Don’t bother making rice. They sell frozen rice now that takes 3 minutes in the microwave. Trader Joe’s has a good jasmine rice, but any will do, really. Make the rice, make the eggs – combine. My family jokes that we have enough tuna to feed the leftover humans after the apocalypse. We really do. But it’s important to keep tuna on hand because it’s so easy. You can make tuna salad sandwiches and melts, and also, see below. I feel like even the busiest family has to go food shopping at some point, right? 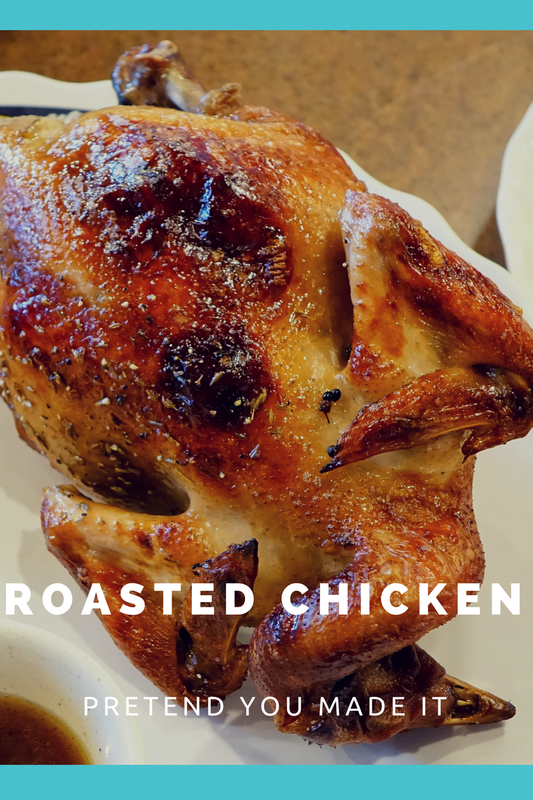 Pick up a whole chicken. We used to get it at Whole Foods when we lived near one, but every supermarket has them now, including BJ’s and Costco, and they’re honestly not bad. I’ve taken to buying salad kits or salad mixes in bags. It’s not as cost effective as buying, washing, and parting your own romaine lettuce, radicchio and endive, or whathaveyou, but it is much easier. When really desperate, I empty a giant bag of salad mix into a bowl, throw some of whatever else I have in the fridge or pantry in there (hard boiled egg, cucumber, olives, random cheese—sometimes, it’s chopped cheese sticks, I won’t lie—canned asparagus or corn, bacon if available, and—pay attention!—a can of tuna! ), salt, oil, balsamic – done. And the tuna makes it a full meal with protein. That’s my story and I’m sticking to it. Listen, whatever. Some days, the kids are munching on cardboard and seem satisfied, and you just can’t imagine eating anything in your fridge right now. 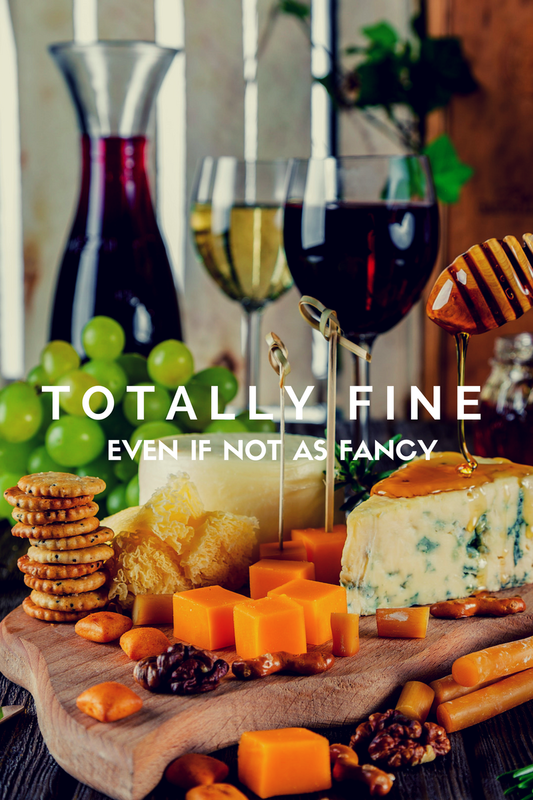 It is totally fine, as far as I am concerned, to pile a slice or two of every kind of cheese you have in your fridge on a plate—again, sometimes, it’s cheese sticks— grab a box of triscuits and pour yourself a glass of wine. If you have a handful of raisins, that’s a bonus. I call that a continental supper. And hey. If it’s that kind of night, and your hand does end up in the menu drawer, that’s fine. There is no shame in that. Order out. But it’s good to have options. Good luck!